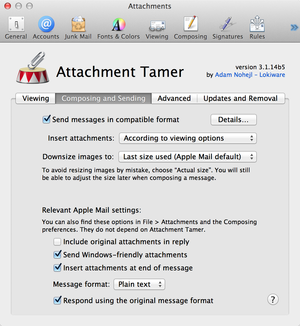 Attachment Tamer lets you customize the way attachments appear to your recipients. 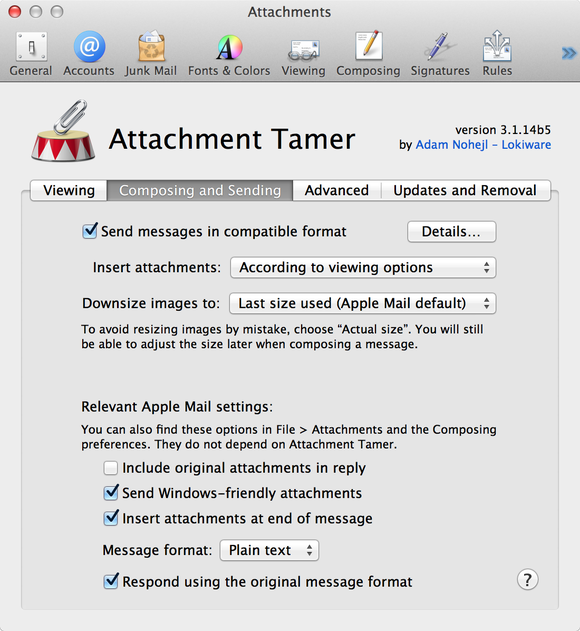 Mail doesn’t always handle incoming or outgoing attachments the way I like. For example, I usually prefer to see icons rather than inline images, and I want to make sure recipients see attachments the same way I do. Attachment Tamer (Lokiware, $15) lets me customize the way attachments behave to my tastes. Unfortunately, some features aren’t yet working in Mavericks, but the developer is working on an update. Speaking of attachments, problems can occur when attached files are large or when the recipient is using a mobile device. You can work around this problem by copying the file to your Dropbox (or other cloud-storage service) and emailing only a link—but that requires several tedious steps. With CargoLifter (Chungwasoft, $10), you attach files as you normally would, but then the plug-in does everything else for you: uploading the file, creating the link, replacing the file with the link in your outgoing message, and optionally compressing the attachments. 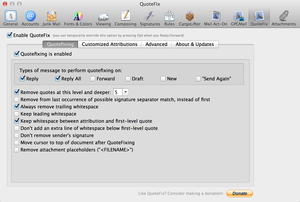 If you use DEVONthink Pro Office (DEVONtechnologies, $150) to organize your documents (and I do), this plug-in—included with the app—lets you add any message to your DEVONthink database with a menu command or keystroke. 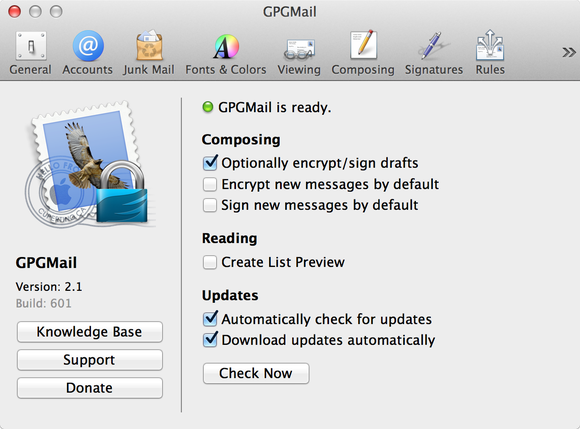 GPG Mail makes encrypting email simple and friendly. Part of GPG Suite, GPGMail (GPGTools, free) gives you OpenPGP-compatible encryption and digital signatures for exchanging sensitive email messages. Although Mail offers built-in support for S/MIME encryption, it’s complicated to set up and use (for both you and your correspondents). GPGMail makes the process much simpler and friendlier. Of all the plug-ins listed here, Mail Act-On (Indev, $25) is the one I depend on most. This multipurpose tool lets you file messages in any mailbox using only the keyboard. You can also create rules that work much like Mail’s built-in rules, except that they can operate individually on demand, or on outgoing messages. The new Mavericks version also lets you schedule messages for future delivery. This plug-in (Gregory Welch, free) once served the crucial purpose of ensuring that the To: and Cc: fields were filled in correctly for messages that you’d previously sent but wanted to follow up on. Now Mail automatically addresses such messages correctly when you choose Reply or Reply All, except in one specific case: When you’re adding to a conversation in which you were a Cc: recipient, Mail still wants to swap the contents of the To: and Cc: fields when you reply. This plug-in ensures that the original To: and Cc: recipients remain intact. From the same developer as Mail Act-On, MailTags (Indev, $30) lets you apply tags to messages, to help organize them. However, what’s even more interesting to me is that it lets you add notes to messages; add calendar events (such as follow-up reminders) to messages from within Mail; and include tags and other MailTags metadata in searches, smart mailboxes, and rules. QuoteFix puts quoted material in replies where it really belongs. When replying to a message, I generally prefer to have my response appear after a brief snippet of the original message, but Mail expects you to type your response at the top of the message, with the quoted portion beneath. 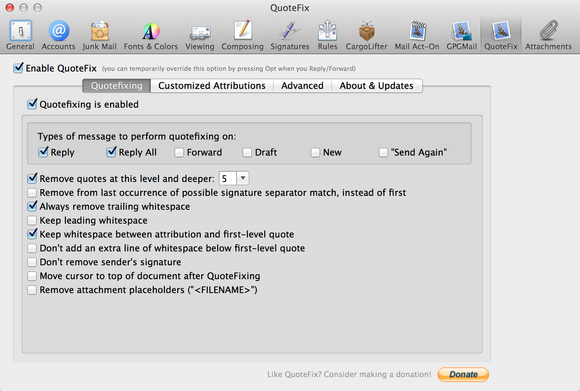 QuoteFix (Robert Klep, free) corrects this uncivilized behavior, putting the insertion point after the quoted text, where it belongs—and it can also remove signatures and empty lines from the original message. If your server-based spam filter isn’t perfect (or if you don’t have one at all), SpamSieve (C-Command, $30) is the best tool by far for keeping junk mail out of your Inbox. And on the rare occasion that it makes a mistake, you can train it to improve its accuracy in the future.